One of the pros and cons of driving a motorhome is that you don’t have to tow it behind you. The benefit of this is that it’s easier to drive a motorhome then tow a trailer; the downfall of this is that if you want to go somewhere outside an RV park or campground, you’ll need to rent a car or take a shuttle. If you own a trailer, you can set up at your RV site and hit the road. Depending on the RV you invest in, you can tow a car behind it, too. Here’s how to start towing a car behind your RV. What Types of Vehicles Can Be Towed Behind an RV? 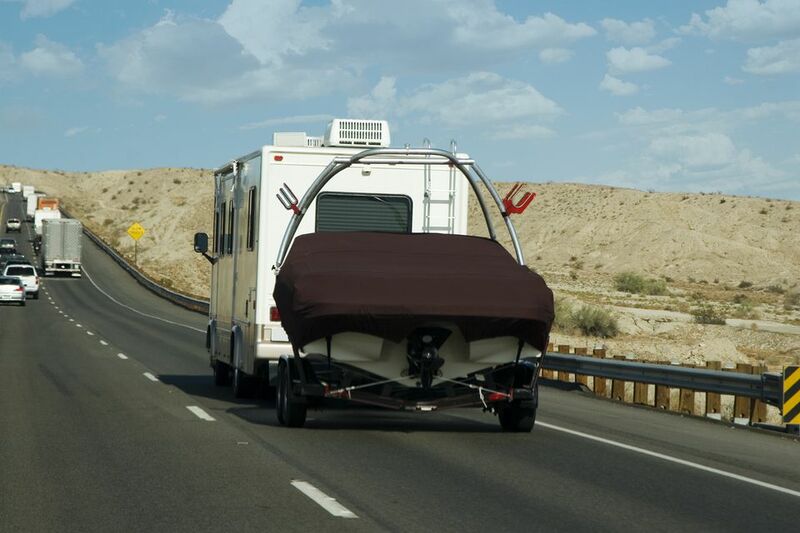 Any vehicle or boat can be towed behind an RV so long as it doesn’t exceed the weight capacity of the towing method you’re using. When selecting a tow method, keep in mind the weight of the vehicle or boat you’re towing to stay within safe weight ranges. Pickup trucks, SUVs, Jeeps, and other vehicles on and off the road can be towed behind about any RV bigger than a Class C motorhome. There are three primary ways to tow a car behind an RV: Using a flatbed or enclosed trailer, using a tow bar, or using a tow dolly. A flatbed or enclosed trailer is one of the easiest ways to tow behind larger motorhomes and fifth wheel RVs. This offers a larger space to bring a car, off-road vehicles, or even add more storage to your existing rig. This method will offer full support for your vehicle, along with its brake and light system. You’re able to bring a variety of vehicles this way you wouldn’t be able to tow behind you with a tow bar or dolly. Being able to take any vehicle will set you back financially as investing in a flatbed or enclosed trailer will be more expensive. Pro Tip: One of the biggest perks of using an enclosed trailer or flatbed trailer is that you can use it to tow more than your car, help a friend move, or store items that don’t quite fit anywhere else when not in use. A tow bar allows you to tow a vehicle behind you keeping all four wheels on the road. This is one of the most affordable and common ways to tow a vehicle behind a rig. Safety chains and cables are used to offer more stability between the tow bar and vehicle, and you will want to invest in a supplemental brake system or lights to alert those on the road when you turn and brake. The tow bar is a cheap way to tow a vehicle behind an RV, but it only works for much smaller vehicles. The biggest disadvantage of this system is that backing up is near impossible; you’ll disconnect your vehicle, drive it off to the side, then maneuver your RV into position when reaching your destination. Pro Tip: Not all vehicles can be towed on all four wheels. Check with your manufacturer to make sure you can tow safely with a tow bar before investing in this solution. A tow dolly tows a vehicle behind your RV by placing two of its wheels on the road and the front wheels on the dolly. This is perfect for those who don’t want to invest in an enclosed or flatbed trailer but can’t tow their vehicle with a tow bar. Some tow dollies come with surge or electric brakes; some even come with lights, so you don’t need a supplemental system to let other drivers know if you turn or brake. As with the other methods for towing a car behind your RV, a tow dolly may not accommodate the weight of chassis of the vehicle you’re towing. Pro Tip: A tow dolly is often the cheapest but not the most beneficial method to tow a car behind an RV. If you have a larger car or vehicle, invest in a more practical tow behind solution for your travels. Invest in a towing solution that works for your RV and your vehicle. Many RV owners forget that because they have an RV doesn’t mean it can tow anything. Look at the weight guidelines for your RV, the vehicle’s weight, and use the right solution to tow safely. Be aware of the length towing a car behind your RV adds. When you turn, merge into traffic, and stop that added length will need you to react differently. You may not be used to the difference. Practice towing your vehicle behind you before hitting the road for your next trip. It depends. There are pros and cons to towing a car behind your RV that you’ll have to determine are right for you. Some of the pros include not renting a car and being able to come and go as you please; some of the cons include increasing your gas mileage, spending the money on a tow package, and getting over the learning curve of towing behind your rig. Keep in mind that you can tow other things besides a car, like ATVs, a boat, and more. Depending on the types of RV you have and the trips you love to take, towing a car behind your RV may or may not be right for you. Look at the trips you take, what type of RV sites you park in, and where you drive to determine if towing a car behind your RV is the right setup for your travels.